Reliable non-invasive differentiation between IBD and IBS. Faecal Calprotectin is an established protein biomarker that is helping to improve patient care and save money for the NHS. Alpha Laboratories offers the widest range of test formats for the measurement of human faecal Calprotectin in the UK. From single point of care tests to high throughput open access laboratory assays, you can trust our experience to help you find the best way for your testing regime and your patients. 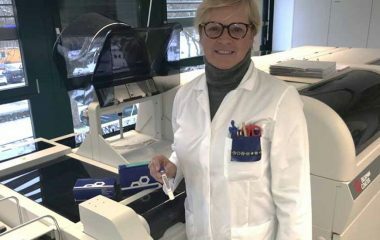 Alpha Laboratories has expanded the offering of BÜHLMANN Calprotectin tests with the launch of the IBDoc® which is the first CE marked Calprotectin home test. It enables more frequent monitoring for better management of IBD conditions. [DG11] Faecal calprotectin diagnostic tests for inflammatory diseases of the bowel. NICE recommends the use of faecal calprotectin as a first-line test in patients presenting with gastrointestinal symptoms indicative of IBS or IBD. BÜHLMANN quantitative, standardised assays that are flexible and scalable, ensure consistent results as your calprotectin testing requirements evolve. Sample preparation is simplified using CALEX extraction devices. 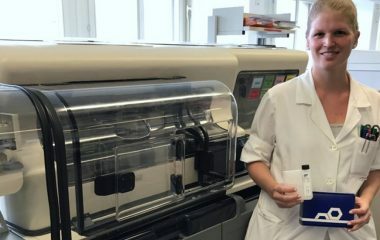 Fully Automated Calprotectin Testing is Here! Recent modifications to the BÜHLMANN CALEX calprotectin extraction devices, now enable them to be used on laboratory track systems. Combined with the BÜHLMANN fCAL® turbo assay this now provides for a truly automated hands off approach to faecal calprotectin testing. Calprotectin is a protein biomarker that indicates the migration of neutrophils to the intestinal mucosa, occuring during inflammatory bowel disease (IBD). It is used to distinguish between IBD and non-inflammatory disorders and to monitor IBD disease activity. It helps improve patient care and reduce health care costs by screening out patients with Irritable Bowel Syndrome (IBS), thus preventing the need for unnecessary endoscopy procedures. Whether you want to perform the test within Primary Care, in the Gastroenterology Clinic or the Hospital Laboratory, or even empower your patients to test themselves, Alpha Laboratories offers the widest range of test formats for the measurement of Human Faecal Calprotectin in the UK. From individual home kits up to high throughput automated analysis we can support your calprotectin testing needs. The NHS Centre for Evidence-based Purchasing concluded in 2010 that using calprotectin tests for differentiating between IBS and Inflammatory Bowel Disease (IBD) supports improvements in patient management and offers substantial cost savings. Since 2013 NICE has recommended calprotectin tests to support clinicians with the differential diagnosis of IBD or irritable IBS in adults with recent onset lower gastrointestinal symptoms. Faecal Calprotectin is a new biomarker which is helping to save money for the NHS by preventing unnecessary procedures on patients by screening out patients with IBS who do not require endoscopies. The symptoms of functional disorders such as Irritable Bowel Syndrome (IBS) and organic inflammatory intestinal disease (IBD) can be very similar in presentation but are two very different medical conditions.